Takeaway: Sodium and chloride are typically viewed as waste ions that plants do not need. This can be true if their levels are high in a water source. However, research has shown that plants do use these elements in small quantities. Function: Sodium is not an essential element for plants but can be used in small quantities, similar to micronutrients, to aid in metabolism and synthesis of chlorophyll. In some plants, it can be used as a partial replacement for potassium and aids in the opening and closing of stomates, which helps regulate internal water balance. Chloride is needed in small quantities and aids in plant metabolism, photosynthesis, osmosis (movement of water in and out of plant cells) and ionic balance within the cell. Deficiency: Sodium “deficiency” does not appear to exhibit any symptoms since it is not an essential element. Chloride deficiency can occur if there is consistently less than 2 ppm chloride in the growing medium and the symptoms appear as chlorotic blotches with necrotic spots located between the veins or on the margins of the younger leaves. 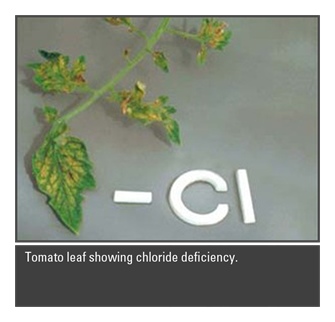 In advanced cases, chloride deficiency could cause plant wilting. Both deficiencies rarely occur since most water sources provide them and fertilizers often have them as impurities. Toxicity: Sodium toxicity appears as necrosis or scorching of the leaf tips and margins, similar to micronutrient toxicities. Chloride toxicity starts as premature yellowing of leaves then it leads to marginal or tip necrosis of older leaves and also bronzing. Geraniums, lettuce and poinsettias are sensitive to chloride toxicity while carnation, penstemon, tomato and verbena are less sensitive. Since both elements can be present in high, but not toxic levels in the growing medium, they can compete with beneficial fertilizer elements for uptake by plant roots. Sodium competes with potassium, calcium, magnesium and ammonium for uptake by the plant. Chloride can compete with nitrate, phosphate and sulfate uptake. Therefore, if sodium or chloride is high in the growing medium, while other beneficial elements are at low or normal levels, the plant, which cannot tell them apart, will take up what is in the growing medium. Therefore the plant may not acquire sufficient levels of a required beneficial element and can leads to its deficiency in the tissue. If sodium or chloride levels are high to excessive in the growing medium, it is most likely coming from the water. Test the water. Problems can occur if sodium and chloride levels in water exceed 50 and 70 ppm, respectively. If so, it is important to allow water to run out the bottom of each container at every watering to minimize build up of these elements. Also fertility levels cannot drop below normal levels as these waste ions will be absorbed in higher ratios vs. desired fertilizer elements. Monitor the salt levels in the growing medium at least every one to two weeks as they can quickly build up. If sodium or chloride levels in the water exceed 150 or 200 ppm, respectively, then reverse osmosis is the best option. Where to Find Sodium and Chloride: Both are normally found in sufficient levels in most water sources. If not, then sodium can be found in trace levels in fertilizers and certain pesticides. Chloride can be provided by fertilizer in the forms of calcium chloride, potassium chloride, ammonium chloride or magnesium chloride. Contact your Premier Tech Horticulture Grower Services Representative if you have questions about element levels in your water. How exactly do mycorrhizal inoculants work?